Also called the Ceylon ruby, the almandine garnet is the most common type of garnet. Though most of these types of garnets are only good for industrial use, the highest quality almandine garnet is a jewel of stunning beauty when it is polished and faceted. Found in shades from brownish red to purplish black, an excellent Ceylon ruby rivals the “regular” ruby in beauty. It even rivals it in toughness. Made out of corundum, the ruby has a Mohs scale hardness rating of 9, while the Ceylon ruby has a hardness rating of 7 to 7.5. Garnet gets its name from the Latin granatus, which means grain, for when humans dug up rocks they would often find tiny grains of red garnet embedded in them. Besides Sri Lanka, high-quality garnets are found in the Czech Republic, Brazil, Madagascar, India, Austria and the United States. The almandine garnet gets its name from the town of Alabanda, which is found in Asia Minor. These garnets are a little hard to distinguish from other red gemstones, but they tend to have darker, more ruby-like tones. A person can tell a garnet from another red gemstone by using a neodymium magnet. A garnet, which is made of such minerals as iron and iron silicate, will respond to a magnet where another type of red jewel wouldn’t. The iron in the gemstone is what gives it its red color. Checking the Ceylon ruby’s refractive index also distinguishes it from other types of garnets. The refractive index is a value that measures the ability of the gem to refract light, and different types of garnets have specific ranges. In the case of the Ceylon ruby, the refractive index is between 1.770 to 1.820. Ceylon rubies are always red though garnets, in general, come in a range of colors. Its chemical formula is Fe3Al2(SiO4)3. It is a transparent gemstone, and Ceylon rubies were traditionally cut with hollow backs to allow more light to flow through them. Almandine garnets that have a few flaws tend to be cut as cabochons, which means they are cut into polished domes but not faceted. Almandines with few or no flaws can be cut into many of the shapes diamonds and rubies are cut into, including oval, heart, pear and trillion. Ceylon rubies can also come with asterisms, but these are very rare. The gem has a bright, vitreous, or glassy luster. It’s a durable gemstone and doesn’t need much pampering, but should be kept away from heat and extreme changes in temperature. The garnet is a silicate gem with a specific gravity of 3.5 to 4.3 and has no cleavage, which means it doesn’t split or break along certain planes. Its crystal system is isometric, which means cube-shaped. It is not fluorescent. If a person scrapes the gem against a streak plate, the streak, or powder color it leaves behind is colorless. Healers who use crystals prize garnets for their energy-giving and regenerative properties. Almandine is especially revitalizing and brings stamina and strength. It stimulates deep love, opens up the higher functions of the mind and brings compassion and charity. Believers say it facilitates the pathway between the base and crown chakras. Because of that, it anchors the spirit to the physical body. It also helps the body absorb iron from the intestines, purifies the blood, lungs, and heart. It also supports the eyes, liver, pancreas, and DNA. Garnets should be worn in contact with the skin, so they are excellent as pendants to lay over the heart, as earrings on the earlobes, or as rings on the fingers. Garnet is the January birthstone and belongs to those who were born under the sign of Aquarius. It’s also the gemstone given on the second wedding anniversary. Specialists associate it the planets Pluto, Mars, and Mercury. Archaeologists know that garnets have been used as jewelry for at least 5,000 years. They were popular gems in ancient Rome. Noah was said to have used a garnet lantern to help him guide the ark during its 40 rainy nights. Garnets were especially popular during the Victorian era. A spectacular necklace made of silver gilt, pearls, enamel and red and green garnets by Schlichtegroll of Vienna now resides in the Victoria & Albert Museum in London. A lovely pendant dominated by a single large garnet cabochon made around 1840 was presented to the museum by Mrs. H.F. Mossockle. 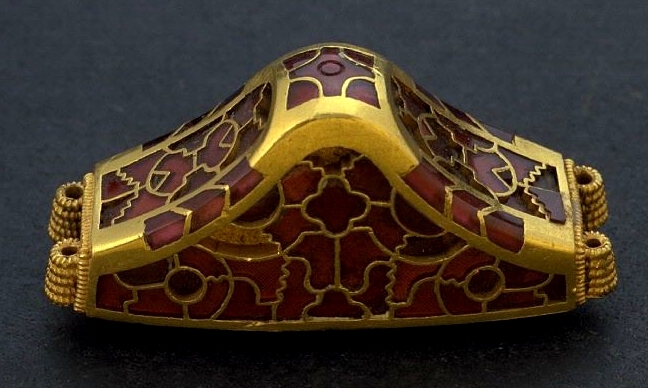 An Anglo-Saxon sword hilt decorated with garnet cloisonné and gold was found in the Staffordshire Hoard in the United Kingdom in 2009. The Hög Edsten sword pommel-cap. Garnet is a mineral we can find all over the world and has been around since the Earth’s formation. It is so common that even now a person might find an ant hill surrounded by tiny specks of it. The ants, having no need of this gemstone, simply moved it out of the way when they excavated their colony. We can find garnet in metamorphic, igneous and sedimentary rock. However, we find most of it is at the edges of converging continental plates. There, a sedimentary type of rock like shale was subject to enough heat and pressure to turn into gneiss or schist over eons. Industrial garnet is so plentiful that people can collect and use it without too much concussion to the environment. It is found naturally ground and crushed in the sands of beaches and river beds. Rock garnet has been processed for hundreds of years. Even gem-quality Ceylon rubies are plentiful and inexpensive when compared to gems such as rubies. Though garnet is used mostly in industry, a gem-quality crystal can be dazzling in its beauty. People have known this for millennia. One thing to know about buying a garnet or any other colored gem is to buy it by the size and not the carat. If well cared for, the almandine garnet can be passed down from one generation to the next. Hey Buddy!, I found this information for you: "Almandine – The Sri Lankan Wonder of Unparalleled Beauty". Here is the website link: https://accessgems.com/almandine/. Thank you.